In this blog post I'm continuing with a series of still life paintings, showing how my process evolves incrementally over time. 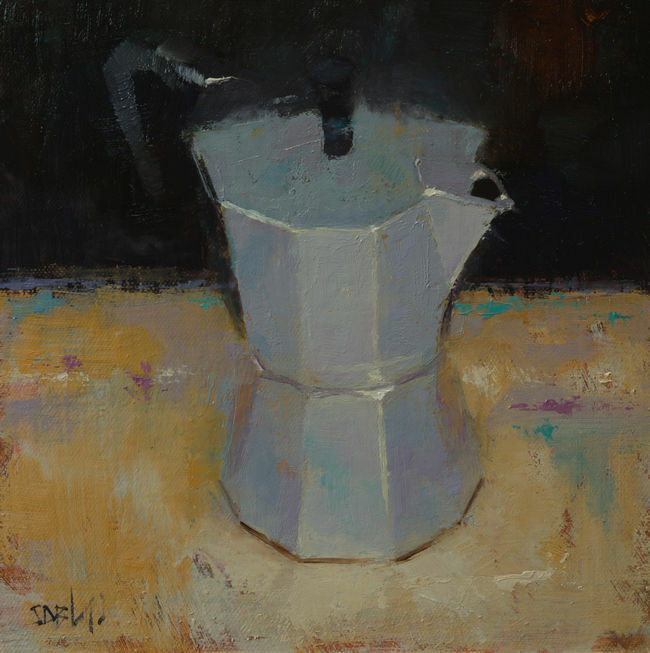 In this painting I'm taking on a difficult subject: an Italian coffee pot. It has multiple sections, a 10-sided design, a handle and, not least, it's shiny. The first attempt quickly became a train wreck—I messed up the drawing—and was scraped off. On this attempt I take more time and get a better result overall. The coffee pot is set on my pochade box next to my easel and is illuminated by the overhead studio light. For this painting I'm reusing a panel that has been scraped and wiped off (the old paint was still wet). I used a fairly dark block-in in raw umber and transparent oxide red. After letting the block-in sit overnight, I started on the main paint layer the next day. The coffee pot was very difficult to draw correctly, so I made many adjustments to it as the work progressed. With the coffee pot resting on the palette of the pochade box, there were a lot of warm reflections in the sides of the pot and I felt that they overpowered the picture. Moka. 8x8, oil on hemp panel. The next day I repainted the sides of the pot and added more color in the background. Reducing the orange tones in the coffee pot made the metal look less reflective and the extra color was added in response. I decided I was OK with that compromise and left the painting as it is now. 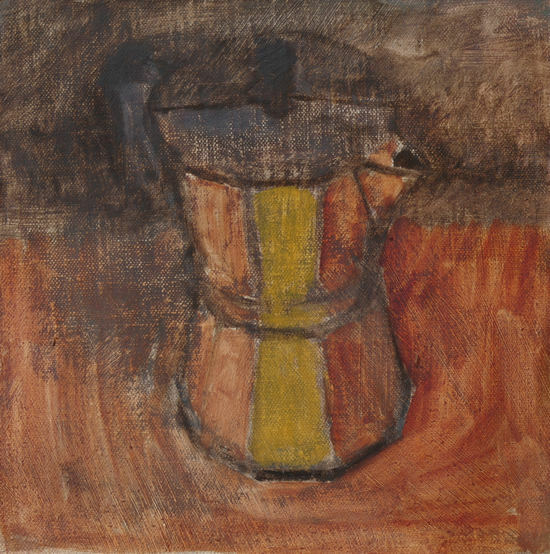 I'm sure I'll be painting this coffee pot again in the future. By the way, it makes a great cup of coffee.